Concrete blocks have become most builders’ go-to product to build the external frame and supporting walls in any building from terrace houses to airports. A sustainable material which can be lightweight and easy to handle, as well as offer high thermal mass or sound insulation, suitable for walls, foundations or floors. Concrete blocks are available in a range of densities, strengths and sizes, made from aircrete or dense aggregate. Civils and Lintels works with Plasmor, Forterra and Tarmac to supply a range of blocks across the country that meet any specification for particular strength or sizes. Our range of concrete blocks includes lightweight blocks, foundation, hollow, dense and solid blocks, as well as aircrete thermalite blocks. Fibolite – An ultra lightweight load bearing block manufactured from Plasmor’s own man-made expanded clay. The clay nodule is an extremely lightweight granule with a hard vitrified outer shell and an air filled honeycombed inner. Fibolite blocks are extremely lightweight offer one hand lift laying have excellent thermal efficiency values provide an ideal key for plaster/render and accept fixings readily. 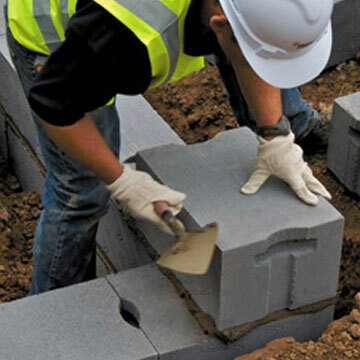 Fibolite blocks are especially suitable for house building extensions repair maintenance and refurbishment projects. Aglite Ultima – A range of low density lightweight load bearing blocks manufactured using a mix of Plasmor’s own man-made expanded clay and high quality lightweight aggregates. Available in a comprehensive choice of sizes and strengths suitable for Housebuilding Industrial Commercial and RMI projects. The 100mm block has a one hand lift of 11.5kg so laying rates are faster and safer. All Aglite Ultima blocks are open textured to accept plaster/render are plain ended and grey in colour. Aglite Foundation – A lightweight aggregate loadbearing block suitable for use below dpc, manufactured from selected aggregates including graded Furnace Bottom Ash, Pulverised Fuel Ash and Plasmor’s Expanded Clay. This block provides a cost effective method of foundation construction below dpc where faster building rates can be achieved with reduced labour and mortar costs. Aglite foundation have a single unit weight of only 14kg allowing savings due to faster laying rates and being safer due to less risk of repetitive lifting injury. Stranlite – A comprehensive range of lightweight aggregate blocks for general purpose use in all types of Housing Industrial and Commercial building applications. Manufactured from high quality approved lightweight aggregates in solid hollow or cellular units Stranlite is available in an extensive range of strengths and in standard or paint grade finishes. Stranlite blocks have a granular surface texture and are plain ended and grey in colour. Plascon – A dense aggregate general purpose concrete building block manufactured in solid hollow and cellular units and in an extensive range of strengths. 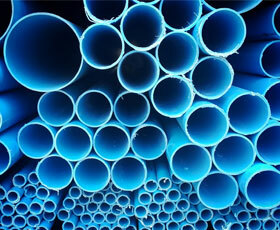 The high density and high strength of Plascon provides high levels of durability and robustness. Plascon Multicore also has high levels of sound insulation. Multicore blocks to 140mm comply with the 20kg single lift requirements of the Construction (Design and Management) Regulations. Plascon is manufactured from crushed limestone aggregate recycled aggregates and pulverized fuel ash. They are plain ended light buff in colour and available in open texture and paint grade quality close texture which accepts direct painting for an attractive smooth and low maintenance finish. Thermalite Turbo and Shield – Thermalite turbo offers very high thermal insulation properties so is ideal where low U-values are required. All sizes comply with one hand lift restrictions. This block is made from 80% recycled content and is available in large format. Thermalite Shield is also available which offers additional moisture resistance. Thermalite Hi-Strength 7 and 10 – These blocks have been specifically developed for structural applications where loading conditions require greater strength, such as flats of three storeys and above, offices, supermarkets and retail parks. Available in a range of thicknesses, the Hi-Strength 7 block is also available in paint-grade finish. Thermalite Trenchblock – Trenchblock is an alternative to the construction of cavity walls with concrete infill, engineering bricks or heavy aggregate blocks for foundations. It is available as standard or with tongue and groove joints and handholds for easy handling. These blocks improve thermal performance and remove the need to mortar perp ends. Topcrete – A range of dense aggregate blocks available in a variety of formats and suited to a number of high loadbearing applications. Available in standard, foundation, coursing bricks, party wall and paint grade finishes. Hemelite – A range of lightweight aggregate blocks available in a variety of formats and suited to a number of loadbearing applications. Available in standard, coursing bricks and paint-grade finishes. To source blocks for your project in any specification, contact your local branch.